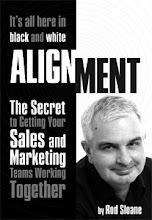 Sales and Marketing Alignment Blog from Rod Sloane: Marry your Best Benefit! I was evaluating a client's marketing brochure the other day and ended up confused. Just one benefit in your market piece, please! If you talked about one single benefit to the exclusion of all others what would it be? Have you got one benefit that you can explain and that prospects want? I bet you haven't! Is it measurable and deliverable? The toughest of you might even say that is too feature led. What would this new business and in that time do for a business? Think in terms of both hard and soft benefits, the mind and the heart, masculine and feminine...can I say that? Go and focus on one single benefit!